The Predictive Engineering and CAE support teams are looking forward to moving this month. 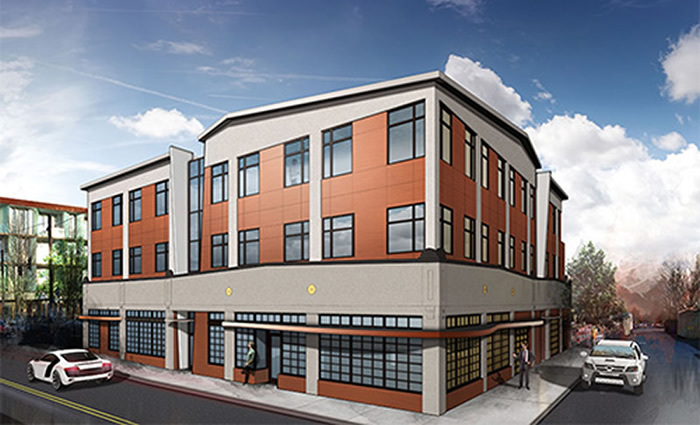 We've secured offices in The Geode, a refurbished and 2-story addition project nearing completion at SE 25th & Division in Portland. The move is short for us, but it's never exactly easy. And our previous location was a bit of a seismic risk. As stress engineers, there was an urgent desire to avoid the sheer irony of dying in a 4-story concrete pancake with a mocking tombstone reading "They knew better..."
We'll post some more pictures as the sheetrock goes up and the desks roll in. Our team recently took on a large project involving very large vessels used to treat noxious organic gasses generated within common industrial processes. They discovered we could provide our client with ASME fit-for-service classification via Elastic-Plastic Analysis and Protection Against Plastic Collapse. In this new DBA case study, the team walks us through the procedure, but keep in mind the key requirement for this method is that the high stress region is localized and is surrounded by regions of material with stresses under the yield stress. READ THE CASE STUDY HERE. Our good friend Marsha Victory has run the publication FEA Information for over 17 years. It focuses on all aspects of Finite Element Analysis (FEA) technology, innovations and solutions with a spotlight on LS-DYNA. As well she's helped run the LS-DYNA Conference held every two years in Dearborn, Michigan. She recently (mostly) retired and due to her unstoppable nature, she's set herself up with a blog. It covers a range of topics from her longtime work with horses, available demo licenses, and most importantly for our friends and colleagues, select not to miss FEA news items. Marsha is posting new items once a week (if not more... did we say she's unstoppable?) and has already come up with an impressive gallery of bullet solid meshing, platform drop testing and more. Please go pay her a visit at FEA Not To Miss!